Spring Season Kickoff. Houston hosts England for this heart pounding match up! Enjoy live music, expert announcing, champagne divot stomp at half time, and an exciting world class polo match! Meet the players afterwards at the special trophy presentation. Ruth’s Chris is the onsite concession. Don’t miss this DOUBLE HEADER! Watch the final two teams in the SPRING CUP FINAL battle for the win. May the best ponies and players WIN! Enjoy Live music, BEST DRESSED COUPLE contest, pony bounce and champagne divot stomp at halftime. FEEL THE THUNDERING hooves of the thoroughbreds as they compete for the ball. PRIZE DRAWING BY PLAINS CAPITAL BANK, stomp divots at the halftime champagne divot stomp, enjoy live flamenco guitar music, expert announcing, MEET THE PROS and Plains Capital Bank representatives at the special trophy presentation after the game. Ruth’s Chris is the onsite concession. It’s SURVIVAL OF THE FITTIST for players in this DOUBLE HEADER match up! WINNING TEAM TAKES ALL. Candy toss for kids at halftime, champagne divot stomp for the adults! So bring a bag or basket for goodies! Enjoy live music, pony bounce at halftime. Ruth’s Chris is the onsite concession. WITNESS THE FINAL 2 TEAMS IN THIS TOURNAMENT FINAL GO HEAD TO HEAD, PONY TO PONY. Enjoy live flamenco guitar music, champagne divot stomp plus, experience the latest 2019 Range Rovers on the field at halftime. Special trophy presentation by Land Rover Houston Central. It’s SURVIVAL OF THE FITTIST for players in this DOUBLE HEADER match up! WINNING TEAM TAKES ALL. Ruth’s Chris is the onsite concession. THESE PLAYERS ARE IN IT TO WIN IT! Check out the MEET THE PROS page in our 2019 HPC magazine. Enjoy live flamenco guitar music, a champagne divot stomp and gorgeous Porsche display at halftime, plus meet the players after the match! Special trophy presentation by Porsche of West Houston. Ruth’s Chris is the onsite concession. Special Mother’s Day match! Ladies BEST HAT CONTEST, door prizes by American National. Champagne divot stomp at halftime and pony bounce! Ruth’s Chris is the onsite concession. TWO TEAMS BATTLE IT OUT IN THIS HEART POUNDING USPA FINAL! Check out the MEET THE PROS page in our 2019 HPC magazine. Enjoy expert announcing, live flamenco guitar music, BEST GENTLEMANS HAT Contest, champagne divot stomp and pony bounce at halftime. Ruth’s Chris is the onsite concession. ANOTHER DOUBLE HEADER! Watch these four teams battle for the win. May the BEST PONIES AND PLAYERS WIN! Enjoy Live music, BEST DRESSED GENT contest, pony bounce and champagne divot stomp at halftime. EXTRA special trophy presentation and prizes by ST. REGIS HOUSTON. Ruth’s Chris is the onsite concession. THIS IS AS GOOD AS IT GETS!! 6 Chukkers of thrilling polo, two teams, only ONE CAN WIN! Root for your favorite pros, check out the MEET THE PROS page in our 2019 HPC magazine. 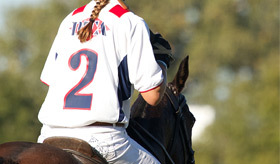 Enjoy great polo, live music, a champagne divot stomp at halftime and door prizes by HPC. Ruth’s Chris is the onsite concession. DON’T MISS THIS DOUBLE HEADER! Watch these four final teams battle for control of the ball and FOR THE WIN. Extra special trophy presentation by Bill Fick Ford. MEET the players, USPA representatives and the Bill Ford team at the trophy presentation. Live music, a champagne divot stomp at halftime and door prizes by Bill Fick Ford. Ruth’s Chris is the onsite concession. Fall Season kickoff! Bring your family, friends or entertain clients. Enjoy live flamenco guitar music throughout the match, the halftime champagne divot stomp plus challenge friends on the pony hops. Enter the drawing for a complimentary polo lesson. Enjoy live flamenco guitar music, player parade, champagne divot stomp at halftime and take a ride on a pony hop. Special trophy presentation. Best ladies hat contest! Champagne divot stomp pony hop at halftime. Don’t miss the player parade at 5pm sharp. Meet the players, buy a polo ball or koozie from the HPC Shoppe for autographs. Best dressed gents contest! Mallet swing contest at halftime plus champagne divot stomp and pony hop. Don’t miss the player parade at 5pm sharp. Meet the players and attend the special trophy presentation right after the game! Player parade at 4pm. Enjoy live flamenco guitar music, mallet swing contest at halftime plus halftime divot stomp and take a ride on our pony hops. Door prizes by HPC, register to win a 10 pack of tickets to any 2019 Spring match! Meet the players, buy a polo ball or koozie from the HPC Shoppe for autographs. Enjoy live flamenco guitar music throughout the match, a champagne divot stomp at halftime plus, challenge friends on the pony hops. Door prizes by HPC. Sign up for a 2 hour polo clinic! Meet the Hendricks Gin Ambassadors! Enjoy live flamenco guitar music and champagne divot stomp. Challenge friends on our bouncy hops! Entertain family, friends or clients. Special trophy presentation by Hendricks Gin. See gorgeous and rare antiques onsite from Harrison’s Fine Antiques and Art. Enjoy live flamenco guitar music, the American National halftime champagne divot stomp or challenge friends on the McDugald Steele pony hops. Door prizes and trophy presentation by Harrison’s Fine Antiques and Art. Mallet swing contest at halftime, live flamenco guitar music, champagne divot stomp and compete in the McDugald Steele pony hop races. See the latest 2018 Jaguars onsite. Special trophy presentation by Jaguar Houston Central. Meet the players, buy a polo ball or koozie from the HPC Shoppe for autographs. Join us for the finale of the largest Women’s Tournament in the World!